Visual Composer Website Builder is a drag-and-drop WordPress page builder plugin which helps beginners and experts create personal or business websites fast and easy )now renamed to WPBakery Page Builder). Turning ideas into reality, the website builder provides an intuitive user interface that permits the designing of professional websites by simply dragging and dropping content elements around pages. Visual Composer also comes with a library of pre-designed templates that are responsive and serve as starting points for creating landing pages, portfolios, articles, and product websites. What is more, Visual Composer boasts its powerful design options to come up with beautiful layouts. It allows the customization of background and application of animations to elements. Additionally, it has a comprehensive list of ready-to-use content elements, enabling the creation of stunning websites from well-crafted pieces of content. Visual Composer delivers a frontend editor which makes the building and editing of a website on the go possible, as well as a backend editor which is useful for creating advanced layouts. It can produce SEO-compliant and mobile-responsive websites, and offers support and security features. 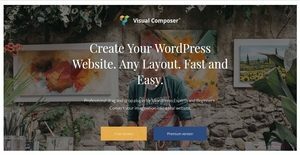 Visual Composer Website Builder aims to help you create websites and pages on WordPress fast and easy. Whether you are a beginner or a professional, the website builder adapts to your learning curve and level of expertise. With this plugin, you can create a website even if you’re not a web developer or a tech-savvy person. In other words, it makes web development and designing simple. Thanks to its drag-and-drop interface which makes you move elements across a page and manage your layout easily and quickly. Visual Composer’s user interface is also configurable. As an example, you can control how you want to navigate through your layout by setting the navigation at the left, top, right, or bottom of the layout. The simple user interface permits the duplication of any element, column or row with just a single click. The default names of elements can be renamed so you can navigate through your layout quickly. In addition, you’ll be able to hide and unhide the elements on a website. You can edit the content of your website from your mobile devices. This is because Visual Composer has a responsive mobile UI (mobile user interface) which makes the management of content through smartphones and tablets a breeze. Visual Composer is equipped with frontend and backend editors which make it easy for you to create your website, and manage its layout, content, and elements. Its frontend editor is actually a live WYSIWYG (What You See Is What You Get) editor. This means all of the changes you make will instantly take effect within the editor, and you’ll be able to see how your website and its content will look like when it is published. On the other hand, Visual Composer’s backend editor is a schematic editor which lets you create and edit the content of your website directly from the admin dashboard of WordPress. This editor shows the structure of your content as rows, columns, and content blocks; and it is very helpful in creating an initial structure for your website or working with landing pages, which contain a large amount of content. When you build a website using Visual Composer, you can access a comprehensive list of ready-to-use content elements to enhance your website and achieve brand design consistency. These premium and well-crafted content elements include text blocks, images, hero sections, buttons, icons, default and custom WordPress widgets, and social media widgets. Also, before you add a particular element to your website, you’ll be able to preview it first. In Visual Composer, you’ll have the freedom to create and design the layout you want for your website. The page builder provides you with advanced design options which permit you to control padding, margin, border, radius, and more. For instance, it has an easy-to-use shape divider which allows you to divide the sections of a website; and apply colors, gradients, image backgrounds, or videos to shapes. Customizing a background is one of the powerful design options available in Visual Composer. As an example, you can customize a background by turning it into a beautiful and smooth carousel slideshow. You can also apply parallax effects to the backgrounds of your sections, columns, or rows; or a zoom in/out effect to give your website a dynamic look and attract the attention of your visitors. Visual Composer permits you to create a mobile-friendly website. It has an intelligent system that automatically makes your website mobile-responsive right from the start. If you want to control the responsiveness of your website, the plugin also makes that possible. You can adjust the responsiveness settings for every type of device. For instance, you’ll be able to hide elements or adjust the spaces for desktop, tablets, or phones. To wrap it up, Visual Composer can be used with any WordPress theme. You can switch between themes without losing the previous content you created from WordPress’ classic or default editor. This is because the website builder has the capability to recognize and convert an existing content. If you are interested in Visual Composer Website Builder it might also be beneficial to examine other subcategories of Best Landing Page Software gathered in our base of B2B software reviews. Since each company has unique business wants, it is sensible for them to refrain from searching for a one-size-fits-all faultless software solution. Needless to say, it would be pointless to try to find such a platform even among market-leading software platforms. The clever thing to do would be to jot down the various vital factors that require consideration such as required features, finances, skill levels of workers, company size etc. Then, you should do your homework thoroughly. Read some Visual Composer Website Builder reviews and check out each of the other solutions in your shortlist in detail. Such in-depth groundwork can make certain you weed out ill-fitting applications and zero in on the solution that offers all the features you need for business success. How Much Does Visual Composer Website Builder Cost? We realize that when you make a decision to buy Landing Page Software it’s important not only to see how experts evaluate it in their reviews, but also to find out if the real people and companies that buy it are actually satisfied with the product. That’s why we’ve created our behavior-based Customer Satisfaction Algorithm™ that gathers customer reviews, comments and Visual Composer Website Builder reviews across a wide range of social media sites. The data is then presented in an easy to digest form showing how many people had positive and negative experience with Visual Composer Website Builder. With that information at hand you should be equipped to make an informed buying decision that you won’t regret. What are Visual Composer Website Builder pricing details? What integrations are available for Visual Composer Website Builder? If you need more information about Visual Composer Website Builder or you simply have a question let us know what you need and we’ll forward your request directly to the vendor.